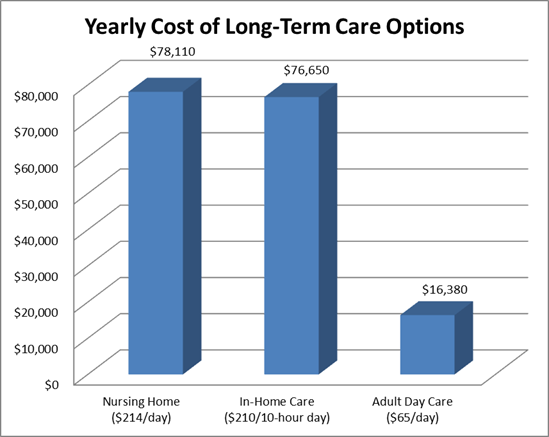 Adult day care is one of the most affordable long-term care options for older adults with chronic illness or other physical and cognitive needs (see our Cost Comparison chart below). AGE’s Adult Day Health Centers accept payment from Texas Medicaid (through DADS, Amerigroup, and United Healthcare Community Plan), Veteran’s Administration benefits, and long-term care insurance. Members who qualify under these programs attend without paying any out-of pocket funds. The private pay rate at AGE of $65 per day includes all nursing care, personal care, meals and snacks, activities, field trips, and more. If you are concerned about funding your loved one’s attendance, please contact us for assistance in identifying appropriate funding options. Cost Comparison – According to the MetLife 2011 Market Survey of Long-Term Care Care Costs – View the full report. 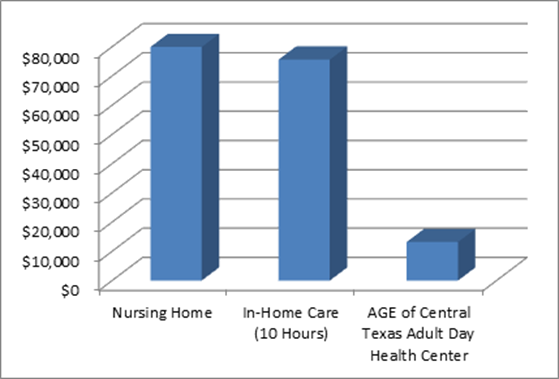 Adult day health care is the most affordable senior care option for older adults with chronic health needs: According to the Texas Adult Day Health Association. National cost comparison of full-time enrollment in various long-term care programs, per year. AGE’s daily cost of $65, which is less than the national average, includes up to 10 hours of supervised care in a safe environment, nutritious meals, medication monitoring, engaging activities, and transportation on a space-available basis.